Oak, pine, cedar, rosewood. H. 35¾, W. 38⅞, D. 29½ inches. Furniture tells us much about the past—about social customs and human interaction, about the relationship between Americans and the world, about the changing nature of technology and the evolution of aesthetics. The Cabinetmaker and the Carver: Boston Furniture from Private Collections, October 4, 2013–January 17, 2014 is part of Four Centuries of Massachusetts Furniture, a unique initiative undertaken by eleven cultural institutions to celebrate and document the Commonwealth’s long tradition of furniture making that started in Boston in the 1630s and continues today.1 This exhibition offers visitors to the Massachusetts Historical Society in Boston a rare opportunity to see nearly fifty examples of significant furniture borrowed from private collections in the greater Boston area. Ranging in date from the late seventeenth century to about 1900, these privately held treasures, supplemented with documents, portraits, and other material from the MHS collections, provide in capsule form a look at the trajectory of cabinetmaking in the Hub. Boston or Charlestown, Mass., ca. 1675-1700. Maple, ash. H. 45, W. 23¾, D. 17⅜ inches. Massachusetts Historical Society. Boston, Mass. attributed to the Harvard College Joiners, Cambridge, Mass., 1670–1690. Oak, maple, cedar, pine. H. 51⅞, W. 45⅞, D. 20½ inches. H. 44¼, W. 37⅞, D. 25½ inches. Mass., ca. 1863. 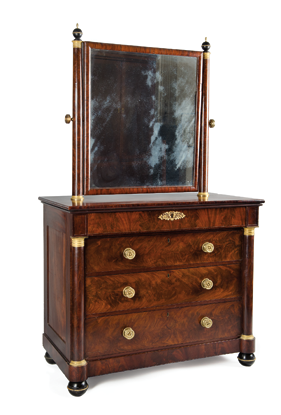 Mahogany with rosewood graining. Central to this exhibition’s purpose is the concept that furniture is an important type of three-dimensional historical evidence, often as revealing (when interpreted) as the written word. By providing a snapshot of Boston’s distinctive furniture tradition, this exhibition, we believe, provides another lens through which to examine the city’s long and distinguished history. The exhibition also focuses attention on the strong body of local collectors who have done so much to preserve the material life of the city’s past. In locating Boston-made objects, these collectors have been forced to draw upon a body of objects seriously eroded by the vicissitudes of time. Since the city’s founding in 1630, the stock of Boston-made furniture, especially the early pieces, has been depleted by wars, numerous fires, and other disasters, all common to any urban environment. The burning of Charlestown after the Battle of Bunker Hill and the British occupation in the Revolution, when anything combustible was used as firewood, destroyed many seventeenth- and eighteenth-century pieces. The dispersal of the Loyalists, many of whom were affluent citizens, also accounted for the loss of many pieces to Canada and England, while the major Boston fire of 1872 and urban renewal in the twentieth century surely caused the disappearance of many other objects from all time periods. Boston, Mass., ca. 17101740. Maple, ash, rush. H. 53, W. 24¼, D. 24¾ inches. Collection of Norman and Mary Gronning. possibly by James Graham, Boston, Mass., 1760–1785. Mahogany, maple, pine. H. 28¼, W. 35½, D. 17½ inches. (closed). Mahogany, mahogany veneer, ash, yellow poplar, eastern white pine. H. 73¼, W. 43¼, D. 23¼. inches. W. 18, D. 17½ inches. Collection of Hilary Fairbanks and Timothy Burton. W. 41⅞, D. 22⅞ inches. Private collection. In good Boston fashion, of course, several objects in the exhibition remain in the same family for which they were originally made. 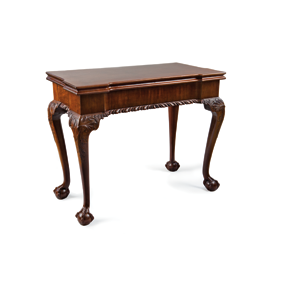 One distinguished example is an unusual merchant’s writing desk (Fig. 4) made for Stephen Salisbury of Worcester. 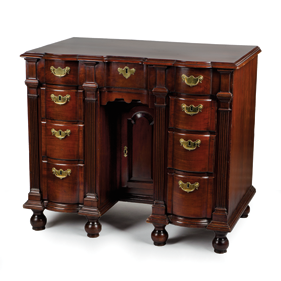 An elegant marble-topped sideboard, notable for (in the words of the Seymour scholar Robert D. Mussey Jr.) having “the single finest example of inlay work on any known piece of Boston Federal furniture” and equal to any produced elsewhere in America, was made for John and Eleanor Derby of Salem. 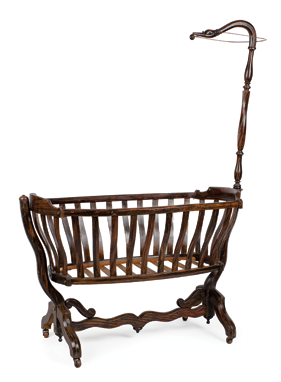 It has passed through many generations of the same family to the present owners.5 The same is true for the cradle (Fig. 5) owned originally by Isabella Stewart Gardner, which has descended through only a few generations to today’s custodians. Several collectors focus tightly on a specific style or time period. 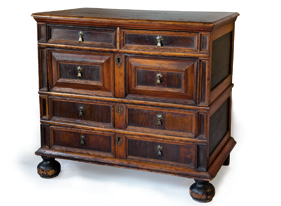 Such is the case with the chest of drawers in fig. 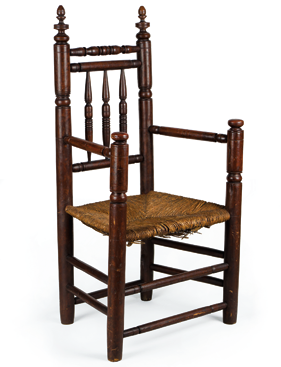 2 and the banister-back chair (Fig. 6), each of which normally resides in the company of a wide range of objects primarily made or owned in early New England. A card table with concertina action (Fig. 7), now attributed to James Graham, comes from a collection with a concentration of Massachusetts furniture in the rococo style. 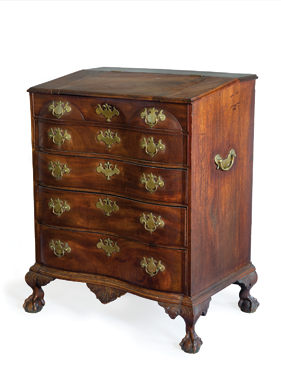 One room in the exhibition is devoted to Boston furniture in the late neoclassical period, primarily by the firms of Emmons and Archbald and Isaac Vose and Son (Fig. 8). possibly carved by John Welch, Boston, Mass., ca. 1760. Mahogany, white pine. H. 28 ¼, W. 34, D. 16 ½ inches. (closed). Fig. 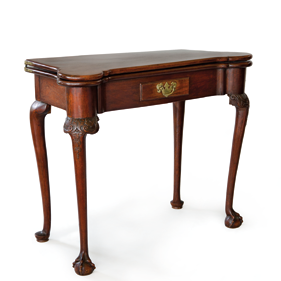 12: Bureau dressing table, Boston, Mass., 17301740. Mahogany, white pine. H. 29¾, W. 35, D. 21 inches. Many objects in the exhibition come from several wide-ranging collections of American art whose owners carry on the tradition of such twentieth-century counterparts as Francis P. Garvan, Maxim Karolik, Henry Francis du Pont, and several others who collected on a grand scale. Selecting just one or a few examples does not do justice to the strength and breadth of their holdings. 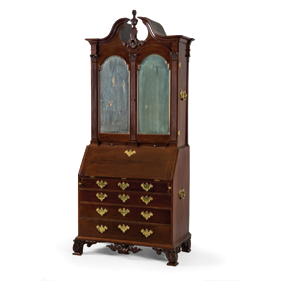 An important rococo desk and bookcase owned originally by Gilbert Deblois of Boston (Fig. 10), with carving attributed to John Welch, only hints at the richness of one given collection. A card table (Fig. 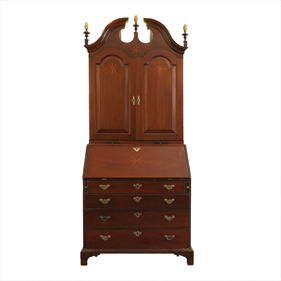 11) owned originally by the Reverend John Howland (1721–1804), pastor in Plympton, Massachusetts, from 1746 until his death, and a dressing table owned in the Parker family of Portsmouth, New Hampshire, and Boston (Fig. 12) are drawn from two other distinguished collections. A “starkly elegant” (in the words of John T. Kirk) desk and bookcase (Fig. 13) similarly represents the holdings of another substantial collection of early Americana. In each case, today’s generation of dealers, auction house specialists, and other professionals have helped guide and form these collections, much as Israel Sack, Hymie Kaufman, and many other early members of “the trade” worked with earlier generations. Fig. 13: Desk and bookcase, Boston, Mass., 1740–1750. Walnut, walnut veneer, white pine. H. 90, W. 38, D. 22 inches. possibly designed by Francis H. Bacon, Boston, Mass., ca. 1885–1895. Oak. H. 63, W. 41, D. 22 inches. Collection of Stephen Judge and James Skelton. All of the collectors represented in the exhibition share a passion for their material. 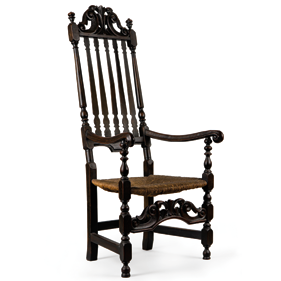 None more so, perhaps, than the architect Stephen Judge, owner of an extraordinary turned chair (Fig. 14) probably made by A.H. Davenport and Company. A working drawing for a very closely related chair exists in a large archive of drawings from Irving and Casson—A. H. Davenport and Company now at the Museum of Fine Arts, Boston. An old photograph (Historic New England) shows the chair in the stair hall of an unknown home, presumably located in Boston. 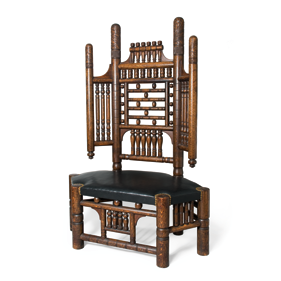 Collected locally about thirty years ago, this chair is today one of the highlights of the Arts and Crafts Movement in Boston, reflecting the historicism and fine craftsmanship that are integral parts of that movement in New England. 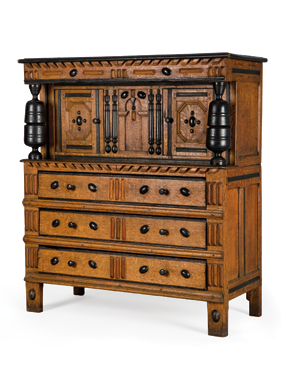 The Cabinetmaker and the Carver: Boston Furniture from Private Collections is on view from October 4, 2013, through January 17, 2014, at the Massachusetts Historical Society, 1154 Boylston Street, Boston, Mass. The exhibition is open Monday through Saturday, 10:00 a.m. to 4 p.m. For more information, including a list of gallery talks, lectures, and other associated programs, see the MHS website (www.masshist.org). Founded in 1791, the Massachusetts Historical Society is an independent research library and an invaluable resource for American history, life, and culture. The author would like to express his gratitude to Brock Jobe, Dennis Fiori, Diane Garfield, Robert D. Mussey, Jr., Anne Bentley, and other members of the Four Centuries steering committee for their assistance, and to the many lenders to the exhibition, who not only were willing to lend their objects but also freely shared their files and knowledge about them. As always, he is indebted to Barbara McLean Ward for her assistance. Unless otherwise noted, all photographs are by Laura Wulf of Lightyears Studios, Jamaica Plain, Massachusetts. This article is based on the exhibition gallery guide. 1. For more information on the consortium, see www.fourcenturies.org. 2. Increase Mather to John Cotton Jr., Dec. 13, 1676, in The Correspondenceof John Cotton, Jr., ed. Sheila McIntyre and Len Travers (Boston: Colonial Society of Massachusetts, 2009), 179. 3. See Catalogue of the Revolutionary Relics Exhibited at No. 56, Beacon Street, June, 1875, 2d ed. (Boston: Ladies’ Centennial Commission, 1875), 10–11, cat. nos. 173-79; 13, cat. nos. 225-26; 26, cat. no. 292. This exhibition included many objects that can be identified in modern collections, including the Sons of Liberty bowl by Paul Revere (15, cat. no. 267), lent by R. G. Mackey, now at the MFA. 4. For Blaney, see The Antiquers (New York: Alfred A. Knopf, 1980), 105–12. For Sack, see Harold Sack, American Treasure Hunt: The Legacy of Israel Sack (Boston: Little, Brown, 1986). 5. 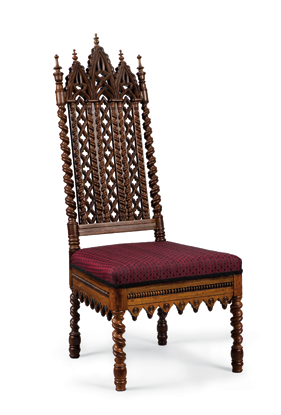 See Robert D. Mussey Jr., The Furniture Masterworks of John and Thomas Seymour (Salem: Peabody Essex Museum, 2004), cat. no. 36. 6. The exhibition includes another local Gothic revival piece, a table that is part of a chamber suite of cottage furniture attributed to Edward Hennessey and Co. with additional painted decoration by Annie Bigelow Lawrence (1820–1893), ca. 1846 (Collection of Mr. and Mrs. Edward L. Stone). of popularity. It passed through several hands and is now part of the large and distinguished L. Knife & Son Corporate Collection. 8. Leonard Louis Tucker, The Massachusetts Historical Society: A Bicentennial History, 1791–1991 (Boston: by the Society, 1995), 16.